This study was conducted to determine how preservice physical educators feel about their level of competence to integrate technology effectively in their professional careers. Billions of dollars have been invested in curriculum and instruction reform and preparing tomorrow's technology-proficient educators. Few grants or projects, however, have focused on helping physical education teacher education programs and K-12 physical education programs in preparing technology-proficient physical educators. International Society of Technology in Education (ISTE) instruments were used for self-assessments on (a) basic computer skill levels and (b) integrating technology into their learning, research, and future teaching. By far, the greatest proportion of each of the three groups of preservice teachers (general preparation, pre-student-teaching/internship, and post-student-teaching/internship) rated their level of competence to be minimal. The findings of the present research demonstrated that preservice physical educators have not been well prepared to be technology proficient in order to teach in this digital age. Liang, G., Walls, R.T., Hicks, V.L., Clayton, L.B. & Yang, L. (2006). Will Tomorrow’s Physical Educators Be Prepared to Teach in the Digital Age?. 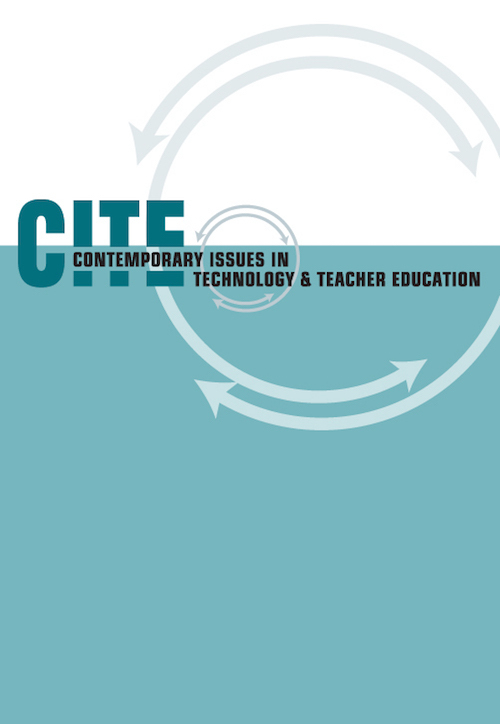 Contemporary Issues in Technology and Teacher Education, 6 (1), 143-156. Waynesville, NC USA: Society for Information Technology & Teacher Education. Retrieved April 18, 2019 from https://www.learntechlib.org/primary/p/5729/. Mayer, R.E., Dow, G.T., & Mayer, S. (2003). Multimedia learning in an interactive self explaining environment: What works in the design of agent -based microworlds? Journal of Educational Psychology, 95 , 806-813. Teacher Education. (1997). Technology and the new professional teacher: Preparing for the 21st century classroom. Washington D C: Author. Parsad, B., & Jones, J. (2005). Internet access in U.S. Public schools and classrooms: 1994 –2003 (NCES 2005 –015) . Washington, DC: U.S. Department of Education National Center for Education Statistics. Taylor, L.M., Casto, D.J., & Walls, R.T. (2004). Tools, time, and strategies for integrating technology across the curriculum. Journal of Constructivist Psychology, 17 , 121 -136. Willis, J. W., & Mehlinger, H. D. (1996). Information technology and teacher education. In J. Sikula, T. J. Buttery, & E. Guyton, (Eds. ), Handbook of research on teacher educat ion (2nd ed., pp. 978-1029). New York: Simon & Schuster Macmillan. Zhao, Y., & Frank, K.A. (2003). Factors affecting technology uses in schools: An ecological perspective. American Educational Research Journal, 40 , 807 -840. Zhao, Y., Pugh, K., Sheldon, S., & Byers, J. (2002). Conditions for classroom technology innovations. Teachers College Record, 104 , 482 -5 1 5 .